PMC’s DMC is a sonically transparent hardware digital monitor controller compatible with all of the company’s loudspeakers with digital inputs which includes our twotwo.5, twotwo.6, twotwo.8, IB2S-A, IB2S XBD-A, QB1-A and the QB1 XBD-A. More than a simple volume control, the DMC accepts two 5.1 and three stereo inputs, and can drive independent 5.1 and stereo loudspeaker monitoring systems. The hardware controls also offer immediate access to configurable bass-management facilities, along with a range of customisable options to optimise your loudspeaker system’s operation for specific working environments, thus sparing users the need to set switches at the rear of individual monitors in the future. The DMC consists of two units, the 1U rackmount Digital Monitor Interface (DMI), into which all of your compatible PMC speakers are connected, and the DMC remote control itself, a tabletop unit powered by a cable from the DMI on which all of the speaker selection settings are made and the master volume is adjusted. A user-calibrated reference monitoring level can be defined if required, user-configurable bass management is available for use with subwoofers, and ‘Surround to Stereo’ and ‘Stereo to Mono’ downmix functions are accessed from dedicated buttons, in addition to the usual channel Mute, Solo and Solo-in-front functions. Per-speaker level Trim adjustments can be made and stored via the DMC, and up to 340 milliseconds of delay can be applied to individual inputs as desired, with two storable presets. As its name suggests, the DMC is an entirely digital device, with digital inputs on BNC connectors; all of its processing and routing is carried out by a 32-bit FPGA, giving an internal dynamic range greater than 135dB, with a latency of 0.042 milliseconds. 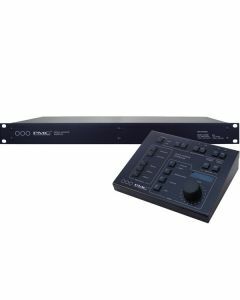 It accepts 24-bit digital signals at sample rates up to 192kHz, and may be synchronised to any of its digital inputs or to an external reference via its sync input. Discrete stereo and surround outputs are accessed via a rear-panel DMI D-sub connector which breaks out to XLRs via a supplied loom. Supported Sample Rates: 32, 44.1, 48, 88.2, 96, 176.4, and 192 kHz (24 bits maximum). Internal Processing: 32 bits Input-to-Output Latency: two samples (eg. 0.042 milliseconds @48 kHz). Digital Audio Inputs: Five (18 audio channels configured as two surround (5.1) and three stereo). Format: AES3-id/SMPTE 276M (Unbalanced 75 ohms/1Vpp) via BNC. Configurable Input Delay: 0 to 340 milliseconds @48 kHz sample rate (scales with sample rate). Sample Rate Conversion (SRC): Available on Stereo Input C.
Input C Sample Rate Range: 8 to 216 kHz (limited to 1/6 to 6 times the output sample rate). Sync Source: Configurable to follow L/R of currently selected input or external reference signal. Sync Input: Word-clock or DARS (AES11), AES3-id, or bi-level and tri-level video. (Jitter: 4 ns pp max). Accepted sample rates: 32, 44.1, 48, 88.2, 96, 176.4, or 192 kHz. Video rates listed in the table below. Connector: BNC (per IEC 60169-8 Amendment 2). Termination: 75 ohms, selectable on/off. Digital Monitor Outputs: 16 (8 AES pairs) organised as two 5.1 and two stereo outputs. Loudspeaker output level offsets: independently adjustable in 0.5dB steps over a ±12dB range. Type: Configurable as AES3 (110 ohms/5 Vpp), or AES3id/SMPTE 276M (75 ohms/1 Vpp). Connector: 25-pin D-subminiature female (DB-25F) with 4-40 threaded inserts. Bass-Management: Supported Sample Rates: 44.1, 48, 88.2, and 96 kHz only. Crossover Frequency: –6dB @40, 50, 60, or 80 Hz. Filters: Symmetrical low-pass and high-pass filters, maximally flat. Filter Slope: 12 or 24dB/octave. Bass-management can be applied independently to the surround and stereo loudspeaker outputs. L and R at 0 or –3dB. C at –3 or –6dB summed equally with L and R.
LFE at full attenuation or –6dB summed equally with L and R.
LS and Rs at –3 or –6dB summed individually with L or R, respectively. C, Sub, Ls and Rs monitor outputs muted. L and R at –3dB summed to C.
L, R, Ls, Rs, and Sub monitor outputs muted. NB: Surround input - Stereo-To-Mono mode makes the centre output the sum of L, C and R at –3 or –6dB, LFE at full attenuation or –6dB; Ls and Rs at –6 or –9dB.